Now that we know some basics of candlesticks, we will get on to deciphering candlestick patterns so that we will be able to trade profitably in the forex market. These candlestick patterns are universal and its good to know about them so that you actually know what is happening in the forex market. We usually see spinning tops when the buying pressure and selling pressure has began to slow down. If a spinning top forms during an uptrend, it means that sellers are preventing prices from rising too high and a possible reversal in the direction of the market could be possible. The reverse is true for a downtrend and the market might move up after several spinning tops form in a downtrend. 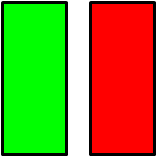 For instance, the green candlestick shows that the open price is the low of the period while the closing price is the high of the period. This is a bullish candlestick (market goes up) and shows strong buying pressure. It could indicate continued bullish behavior or bullish reversal. The reverse is true for the red candlestick (bearish candlestick) and it shows strong selling pressure and could indicate continued bearish behavior or reversal. 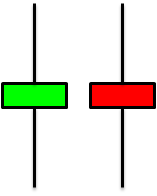 Doji candlesticks have almost the same open and close price. As a result, their bodies are extremely short such that it looked like a straight line. Doji shows a duel between buyers and sellers but neither is able to gain the upper hand, causing the market to close at or very near the open price. There are 4 different kinds of doji and for the purpose of this tutorial, you do not have to know the difference. Doji is one of the few candlestick patterns that you can implement right away into your trading strategy. If a doji forms right after a white candlestick (green candlestick which signals uptrend), it shows that buying pressure is slowing down as there are insufficient buyers to move the market up anymore. Therefore, you could use the opportunity to sell the currency pair. If a doji forms right after a black candlestick (red candlestick which signals downtrend), it shows that selling pressure is slowing down as there are insufficient sellers to move the market down anymore. Hence, it could be a good opportunity to buy the currency pair. Do take note that all trading indicators are usually good in theory only. Learning to trade is like going to school in order to learn a skill. You learn different theories but when you go out to the real world, your education is only useful to a certain extent. You have to be extremely flexible with what you learnt in order to succeed. With that, this tutorial has come to an end. Next tutorial, we touch on specific candlestick patterns.